This is a composition that I have done before, but not as small as this. When it comes to subjects or compositions I have two criteria. I don't want to repeat what other artist do and I want to "ad something new to the conversation". To paint something, I have to believe/feel that I can at-least accomplish on of those. 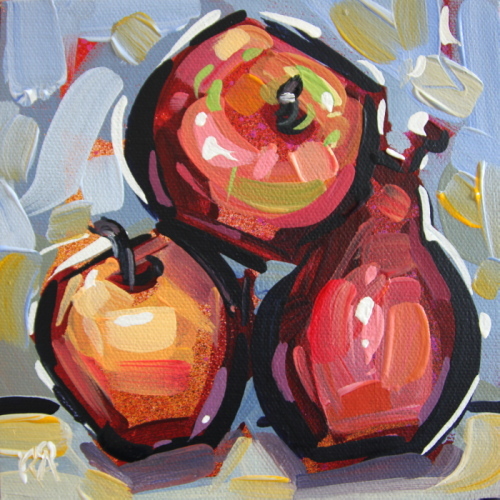 Painting fruit is a common subject and I often get stuck because I don't think it is fun or unique enough. I have done a few that I probably won't post, but this one I like. Very amazing abstract composition !!! 54 year old Swedish painter. I try to paint daily, and painting has become more than a hobby, it has become a passion. What drives me to paint is to create compositions, interpreting objects, and create something that is personal. When people see my paintings I hope that they recognize my style and know who painted them. To buy a painting or just take a look on all my paintings, visit my Daily PaintWork gallery. Prices include shipping and handling. All images are copyrighted by Roger Åkesson. The use of any image from this site is prohibited unless prior written permission from the artist is obtained.